News arrives from Burgess and the Monaco office of Oceanstyle that they've been appointed joint worldwide central agents for the sale of the 34m performance motor yacht Blue Angel. 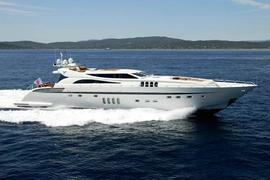 Built in 2005, she's one of the successful Leopard 34 series from Italy's Arno yard. Blue Angel has a number of special features including private sun lounging area on the flybridge, carbon fibre galley and foredeck lounge area. The master suite on the main deck has a split level ensuite with Jacuzzi and there are a further three guest cabins on the lower deck, including a full beam VIP. Triple 2000hp MTU engines give speeds in excess of 35 knots and Blue Angel, located in San Remo, is asking €4 million.